The discussion is not a new one. It's been going on for well over 100 years. 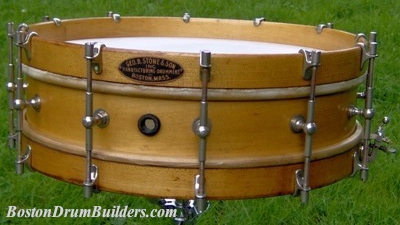 But the early 20th century Boston based drum builders seem to have had a clear bias towards wooden drum shells. Why was that? There are a lot of reasons I think. 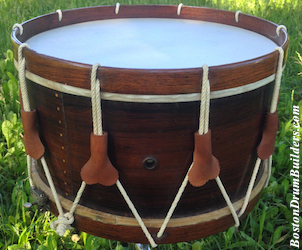 For one, consider the tradition from which drum builders in New England evolved. At the turn of the 20th century, the Civil War was still relatively recent history and the demand for military instruments had played a major role in the rise of drum makers. Metal shell military drums most certainly existed at this time, but using the most easily accessible and least expensive materials meant that lots of hardwoods were used by the Boston builders. This explains why the overwhelming majority of 19th century rope drums made in the northeastern United States were built using wooden shells and counterhoops. Also, consider the task of carrying around a metal shell drum. Construction techniques didn't yet exist to make thin metal shells that were as strong as wooden shells. That meant that early metal shells were either precariously thin and unstable, or unnecessarily thick and thus uncomfortably heavy. Additionally, while it seems an obvious concept now, snare drum stands were not yet common at the turn of the 20th century so the snare drummer often stood and carried the drum, even for non-military musical styles where marching was not involved. As popular music blossomed in the early 1900s, so did instrument manufacturers who were eager to supply theater and orchestra musicians with tools for their trade. Construction techniques were adapted to produce gradually smaller drums which were easier to transport and were more appropriate for indoor dynamic levels. And while metal rod tensioning systems came to replace the more traditional rope tension styles, wooden shells and hoops remained en vogue with the Boston builders well into the 1920s. There seems to have been a regional element involved as well. Relative to drum companies in other parts of the country, the Boston builders on the whole were woefully slow to evolve. 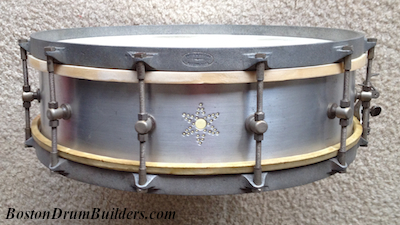 Metal shell snare drums had been in production in the United States since the late 1800s by Duplex of St. Louis but the company was soon eclipsed by the much larger Leedy company of Indianapolis. Leedy's output was then matched and surpassed by Ludwig & Ludwig of Chicago who's brass shell drums would become the industry standard. Boston's largest drum builder, George B. Stone & Son, was minuscule in size compared to the Midwestern titans and hardly manufactured metal shell drums at all. Stone did distribute some metal shell drums and even assembled a small number of all metal Master-Models, but the more successful and enduring metal shell drums came from the Midwest. History has proven that. Only Nokes & Nicolai seems to have had any degree of success at all producing and marketing an All Metal Drum in Boston but the company was sold in 1926 - to a rawhide company in Chicago.